If you’re looking for a killer grill recipe for Memorial Day, this web I’ve got one for you. It’s one of those dishes that everyone from your little brother to your cranky old aunt just loves. They always come back for seconds and thirds so make sure you make a lot. They’ll tell you it’s their new favorite way to eat skirt steak and ask you for the recipe. And best of all, shop it’s super easy and can be done mostly in advance. Except for the grilling of course, cialis sale but isn’t that always a group activity on holidays? The steak is marinated overnight in soy sauce, orange juice and a little sugar, which makes it super tender and caramelizes nicely when it hits the grill. And I’ve said it before – Argentinians know their beef. 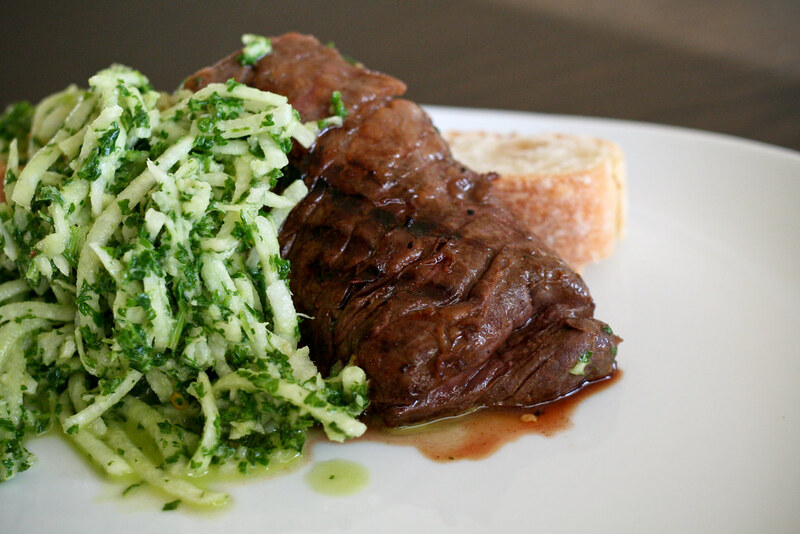 Nothing is better with beef than vibrant, garlicky chimichurri. I make mine with parsley, olive oil, white wine vinegar, lemon juice, garlic, red pepper flakes and salt. It makes the jicama burst with flavor. If you’ve never cooked with it, jicama (HICK-ah-mah) is a root vegetable with mild flavor and the texture of a firm pear. It’s crunchy without being overly so, and is a cool contrast to the steak. If you’re still deciding on your Memorial Day menu, give this a shot. You and your guests will not be sorry! If you can’t find jicama, just serve the steak with the chimichurri and your favorite side – it will still be excellent. At least an hour or up to 12 hours before you’re ready to eat, whisk together the soy sauce, orange juice and sugar. Cover the steak with the marinade and refrigerate in a covered dish until 30 minutes before you’re ready to start grilling. While the steak marinates, make the slaw. Start by shredding your jicama. I used the grating attachment on my food processor, but you can also use a good box grater, or simply cut into small matchsticks. Place in a large bowl. In a food processor or blender, pulse the remaining ingredients – parsley, olive oil, vinegar, lemon, garlic, red pepper and salt – until there are no big garlic or parsley pieces. If you don’t have a machine, mince the garlic and parsley as thinly as possible and whisk with the remaining ingredients. Pour the chimichurri over the jicama and toss until evenly coated. Half an hour before you want to start grilling, remove the steak from the fridge to take the chill off. Heat your grill to medium and cook the steak for 3 – 4 minutes on each side, depending on the thickness of your steak (mine was pretty thin). Remove and let stand for 5 minutes before cutting. Sounds great! I really like what you did with the marinade for the skirt steak with the orange and soy. Right on. The thought alone of chimichurri always gets my mouth watering as well. Can’t wait to make it. Wow – this sounds like a perfect combination of flavors and textures! It’s on my list. Please cionsider a print function. It’s so much eeasier than cut and paste into word or google! Keep up the great stuff. I am so glad I found you! I am a soup and salad fan and yours look amazing. I heard about you on Ronda’s All the Best blog. This sounds perfect. Love jicama, it’s got a great texture and is so refreshing! This sounds great… I am adding it to my shopping list for tomorrow’s lunch. I also found you via Ronda’s All the Best! 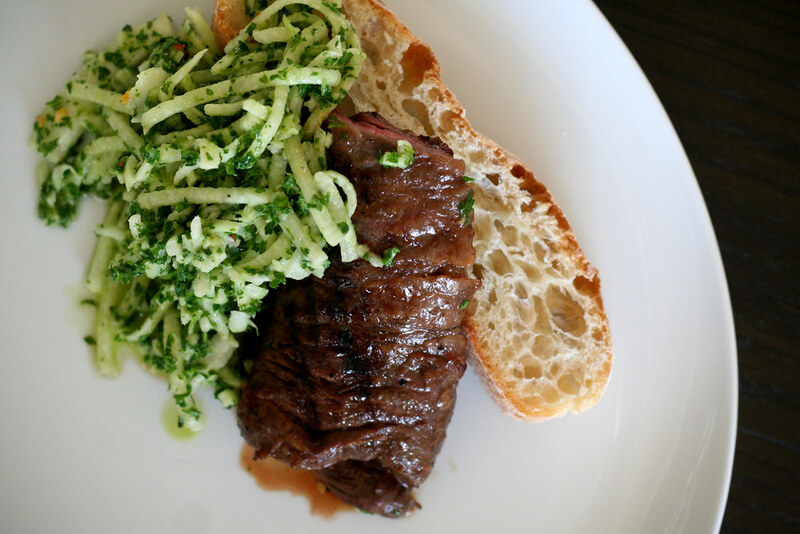 I love skirt steak chimichurri, but the jicama chimi is inspired! Great idea! I loved the Jicama slaw. It was actually the first time I ever tried Jicama. I will definitely make that again. I also took a photo of my version ….